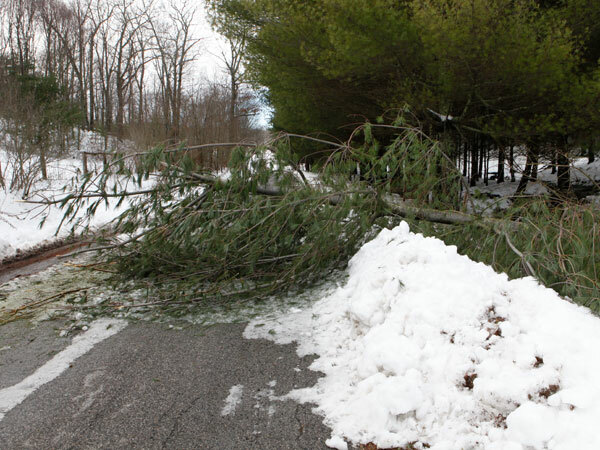 Downed pine blocks part of Bethlehem Church Road in Floyd County on Sunday. More than 20 percent of Floyd County homes remain without power this morning as Appalachian Electric Power (AEP) failed to meet its promise to restore electricity to all county homes by Saturday night. AEP’s outage chart on its web site showed 1,899 homes powerless at 6 a.m. Most homes went dark early Christmas Day. That 21.4 percent of the county’s homes. Company spokesman John Shepelwhich said Saturday power would be back on by last night. He cited “good weather” as a helpful factor in getting downed trees off electric lines. But the company failed to meet its self-imposed deadline. Power is still out to more than half the 3,400 homes that lost it on Christmas Day. I want to thank you for keeping us up to date on the power situation. This web site has become a “must check” for up to date information on what is happening in Floyd County. Our power came back on around 3 p.m. today. It went off Christmas morning but the power company said it expected to fix it by Friday evening. On Saturday morning, they said it would be back on around 6 p.m. This morning we couldn’t get through to get a new estimate. On Monday, we’re buying a generator. Q: How do you know when an AEP spokesman is lying?